The Most Gorgeous Sabyasachi Brides Of 2017! Sabya (as his #BrideTribe calls him) has established himself as the pioneer of all things handmade, preserver of values, and endorser of all things Indian! A Sabyasachi bride is a vision to behold and most often looks like she deserves a throne to herself. This ice blue Sabyasachi lehenga had to be on the top of our list because of the versatile ways it has been styled in. Don’t believe us? See for yourself. 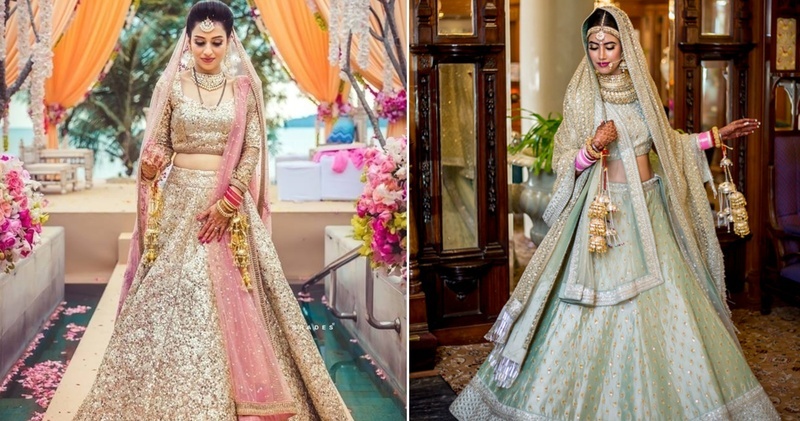 These 2 brides have styled the same lehenga in 2 completely different ways. In the first look, we love the offbeat styling of the blue lehenga with emerald green kundan jewellery. In the second look, we can’t take our eyes off this minimalistic bride. She has pulled off a complete bridal look without any heavy jewellery, nath or maang tikka and still looked so gorgeous! All that glitters is definitely gold for this bride. She chose to wear a Sabyasachi gold shimmery lehenga paired with a sheer pink dupatta and looked her most beautiful self. Amrita Puri chose to wear this stunning ivory and gold Sabyasachi lehenga from his Udaipur collection. The lehenga comprised of hundred and eleven colours of silk thread in vintage Persian shades and was embellished with bugle beads, hand-cut sequins, crystals and pearls, grabbing eyeballs all the way. How gorgeous is that neckline though? If pastels are not your thing but you don’t wanna opt for the bright colours too, then you can always go for a subtle option like this one! This pink raw silk lehenga with its intricate zari and zardosi embroidery is the perfect choice for you! Is it just us or you too are finding it really hard to take your eyes off this bride’s egg shell blue uber chic lehenga? We say #StunnerAlert! This one is another stunner wearing Sabyasachi’s signature color - gulkand burgundy! The high waisted velvet flared lehenga skirt with zari and resham embroidery compliments the heavily embroidered blouse in the most royal way ever. Are you planning to be a minimal bride? Then you’ll love this stunner in ivory too! She looks like a dream in this ivory crystal, canvas and silk Sabyasachi creation from his Ferozabad collection. So minimal and yet so stunning! What we love most about this blush pink lehenga is the golden detailing and the peplum blouse, making it look so unique! If you too love bling a lot, you can opt for a shimmery number like this one. What we love the most about this gold Sabyasachi lehenga is the burgundy border in the lehenga skirt. Gulkand burgundy is the master courtier’s signature colour and all the pieces from that collection are gorgeous! Don’t you too dig this wedding lehenga with the velvet dupatta giving the whole outfit an edgier look? We know a lot of you Indian brides don’t feel complete without wearing the colour red for your wedding and thus we included this stunner in our list. This red raw silk lehenga with its intricate zari and zardosi embroidery is to fall in love with. So which one of these Sabyasachi lehengas is your favourite? We know, but you still gotta decide gal!